SDSF is working with the City Of Stockton to relocate the Hunter Square Fountain Spire. The Spire was originally designed in 1965 by Glen Mortenson, Architect and Director of SDSF. The Spire adorned the Hunter Square, the historic central plaza next to the San Joaquin County Courthouse, for 48 years. Since the new courthouse construction, after its removal from Hunter Square, the sculpture has been preserved by the City of Stockton. Now the City of Stockton and SDSF have found a new home for the Spire in the center of the unused fountain in Martin Luther King Jr Plaza. Due to the drought, the Spire will continue its life in the unused fountain as a beautiful piece of monument art and history. The public had a chance to express their preference for the design option around the Spire and chose overwhelmingly the Sundial Option! At MLK Plaza, the Spire will have the opportunity to continue its story, melding and preserving history while creating new energy in the revitalization of the park. As a Sundial, the Spire will have new life as public art, while teaching the public about the path of the sun and Stocktonians about their own unique place in the world. 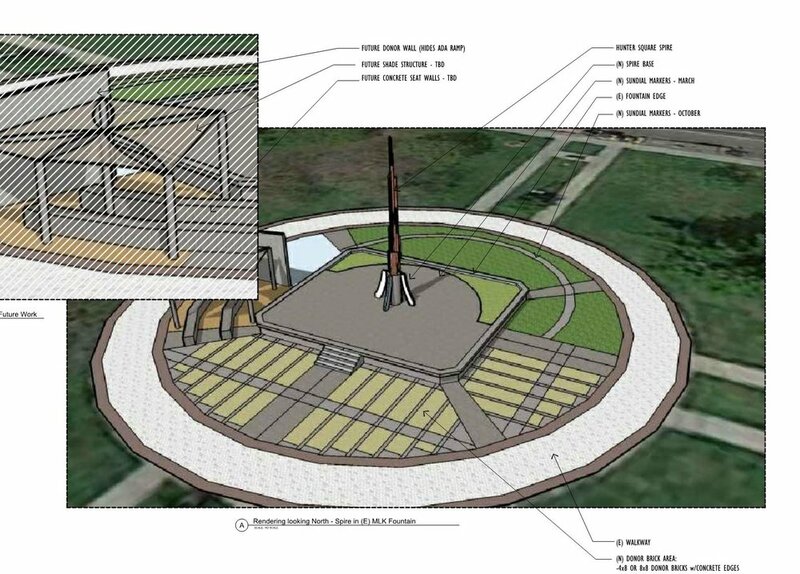 The Spire and its tall narrow width, will serve as a sundial in and around the unused fountain basin at MLK Jr Plaza. There will be two fixed markers for two paths of the sun in Spring and Fall.